As the Olympics in Rio come to a close, it's also four years since the end of London 2012. One of the sports that always takes place over the final weekend is Mountain Biking, the cycling event Team GB takes least interest in, with the women's race on the Saturday and the men's on the Sunday. You probably never saw the 2012 event on TV, the marathon was on at the same time, which is a shame given how much effort was put into creating the one-off venue. 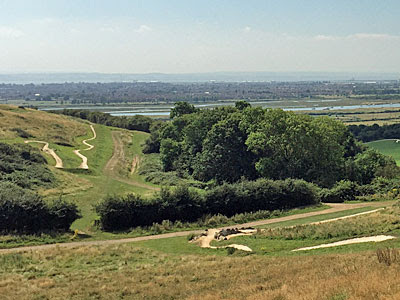 Hadleigh Country Park in Essex was selected as the location, after the IOC had complained that the hills round Brentwood weren't anywhere near mountainous enough. 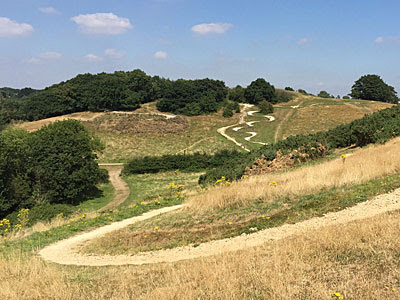 A sinuous course was designed and installed, with steep drops and sloggable ascents, across a patch of sloping farmland overlooking Canvey Island. The resulting facility was rather more scenic than it sounds, and the good news is that the course is still there, and freely open to the public - a nugget of Olympic legacy that's well worth a visit. The Hadleigh Park mountain bike circuit lies in the far southeast corner of Essex, almost in Southend, about halfway between Benfleet and Leigh-on-Sea. A lumpy grassy landscape tumbles down to the railway line, and Hadleigh Marsh beyond, a strategically important location as confirmed by the ruined castle at one end of the ridge. The land belongs to the Salvation Army, who had to agree to its change of use, although their herd of Red Poll cattle still grazes across the site so all has not been lost. The Sally Army have in fact been here for 125 years, their long-term aim to use Hadleigh Farm to provide residential employment opportunities for destitute Londoners, and still have several facilities across the site. I wasn't successful in getting an Olympic ticket, but I came to the test event the previous year and was blown away by the spectacle [report] [24 photos]. So I'm pleased to report that the 5km legacy course looks much the same, minus the magenta hoardings, the food stalls and the torrent of speeding bikes. The course wasn't devoid of bikes on my latest visit but only a few had taken the opportunity to come practise and enjoy, with the majority of younger riders flocking around the concrete bowl and drops of the Skills Area instead. You've got to learn somewhere, and much of the main course is more challenging than an unskilled, or unfit, cyclist would manage. The difficulty of each harder section is clearly marked, both on the trail map and on the ground, with three categories ranging from blue through red to black. Blue means Moderate, for confident off-road cyclists only, while red is Difficult for the advanced or experienced. The surface of these sections is often rock rather than earth, with stone slabs strategically laid and some awkward gradients. But it's black you really have to watch out for, these being technically demanding obstacles kept over from the Games, and for quality mountain bikes and bikers only. Many still have the names given to them by local schoolchildren, for example Deanes Drop or the Leap of Faith, not that this'll be much comfort if you end up crumpled at the bottom. Rest assured there's always a parallel easier route, so these Severe sections shouldn't put you off turning up. But the area around the course isn't just for cyclists, think of it as hillside to enjoy. Whilst walking along the track itself is frowned upon, indeed potentially dangerous, there's no problem rambling alongside or setting off up some slope or through some thicket by yourself. The site's also permeable from outside, indeed a public footpath runs straight through, so there's no question of the wheel-less being excluded. Many Essex families make it no further than the grassy brow of Sandpit Hill and settle down to stare out across the action and the Thames estuary below. When you've seen the view, you can't blame them. Beyond the immediate contours tiny trains rattle past harvested fields, Southend-bound flights swoop in over Canvey Island, lines of container cranes shuffle invisible imports upriver, and the low hills of Kent rise beyond a sparkling grey estuarine strip. Bring a picnic, stare. Ideally you'll visit with your bike. If you're coming from London and don't fancy the 30 mile ride, you can bring your bike on the train, or stick it on the top of your car. Parking at Hadleigh costs £1.50 an hour, capped at £6, with an electronic barrier to catch you on the way out. It's also perfectly possible to hire a bike from the Visitor Centre when you get here, with the going rate £10 for the first hour and £5 for each extra, or £30 to ride all day. I didn't come to cycle so I walked, for around three quarters of an hour up from Benfleet, and fractionally longer back down to Leigh on Sea. It's a glorious walk, if you hit the weather right, with plenty to see along the way. 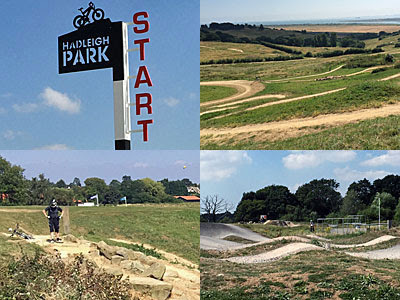 • Hadleigh Park: Originally Hadleigh Country Park, 2012 has been used as an excuse to revamp and rebrand. The park extends well beyond the mountain bike course, with woodland tracks and all-weather trails, with the opportunity to enjoy a lofty panorama or walk at marshside estuary level. • Rare Breeds Centre: A short walk from the cycling, and with its own separate car park, this farm-style attraction will greatly cheer the younger members of the family. Meet Dylan the donkey and a pig called Captain Jack, plus dozens of goats and sheep, then wash your hands before heading to the Sally Army Tea Room chalet. • Hadleigh Castle: Now 800 years old, the ruins of two drum towers and a barbican are all that remain of this defensive fortification, now under the ownership of English Heritage. Freely accessible, and free to enter, this is prime day-out territory for many an Essex family with children merrily clambering over and into all that remains.